Multi-Walled Carbon Nanotubes (MWCNTs) are characterized by walls formed by a one atom thick sheet of carbon. Using MWCNTs as a drug delivery system, the requirement for the solvent and drug dissolution in a solution can be avoided. Soyasapogenol B (SSB) is a product derived from soya bean that belongs to the family of oleanane triterpenes. It is also known to have biological functions in cell signaling, membrane integrity and stability and energy storage. Soyasapogenol B may demonstrate hypo-cholesterolemic effects. Soyasapogenol B happens to be an important therapeutic agent due to its many biological activities. 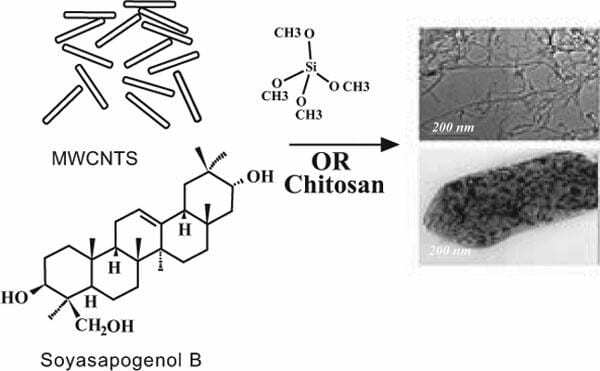 SSB can be loaded with MWCNTs with tetraethyl orthosilicate (TEOS) and/or chitosan. By using miniemulsion techniques, SBB was immobilized onto MWCNTs. Additionally, niosomes were used to enclose the prepared systems. The analysis of the particle systems was done by Fourier Transform Infrared Spectroscopy (FTIS), Transmission Electron Microscopy (TEM), and size distribution analysis. Kinematics of the release of the particles and SBB particles that had an in vitro release profiles, were carried out. In vitro cytotoxicity of synthesized materials was analyzed and was examined by using cell lines such as normal melanocytes (HFB4), liver and carcinoma breast by the comparison with standard doxorubicin. The results of the experiment revealed that SSB loaded materials were able to display controlled and sustained drug release, which also obeyed mathematical in vitro profiles in line with multiple models. The preparations were also minimally cytotoxic in all cell lines tested.